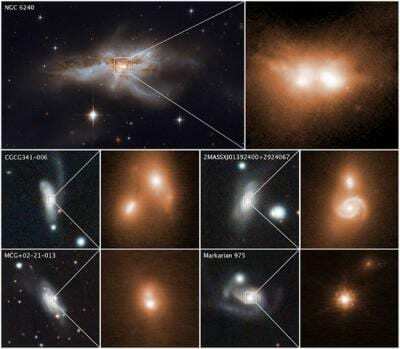 "Seeing the pairs of merging galaxy nuclei associated with "huge" black holes so close together was pretty amazing," said study leader, Michael Koss of Eureka Scientific Inc. in Kirkland, Washington. "The images are pretty powerful since they are ten times sharper than images from normal telescopes on the ground. It's similar to going from legally blind (20/200 vision) to perfect 20/20 vision when you put on your eyeglasses. In our study, we see two galaxy nuclei right when the images were taken. You can't argue with it; it's a very clean result which doesn't rely on interpretation." The team's results appear online in the November 7, 2018 issue of the journal Nature. Koss and his team of researchers made the discovery after completing the largest systematic survey of nearby galaxies using high-resolution images taken with W. M. Keck Observatory's adaptive optics (AO) system and near-infrared camera (NIRC2), along with over 20 years of archival Hubble Space Telescope images. With this survey, astronomers can pinpoint the type of galaxy most likely to harbor close pairs of supermassive black holes. "This is the first large systematic survey of 500 galaxies that really isolated these hidden late stage black hole mergers that are heavily obscured and highly luminous," said Koss. "It's the first time this population has really been discovered. We found a surprising number of supermassive black holes growing larger and faster in the final stages of galaxy mergers." It's not easy finding galaxy nuclei so close together either. The late stage of the merger process is so elusive because the interacting galaxies kick up a lot of gas and dust, especially in the final, most violent stages of the merger. A thick curtain of material forms and shields the galaxy nuclei from view in visible light. Astronomers did not have the capability to observe this type of event until now. "Heavily obscured galaxy nuclei don't have a bright point source in the center like a lot of luminous unobscured supermassive black holes do," said Koss. "But we were able to detect them thanks to X-ray data from the Burst Alert Telescope (BAT). We then used the superior laser capability of Keck Observatory's AO system to perform high-resolution, near-infrared imaging to distinctly see a double nucleus through the gas and dust and uncover the hidden mergers." Koss and his team's findings support the theory that galaxy mergers explain how some supermassive black holes become so monstrously large. "There are competing ideas; one idea is that you have a bunch of gas in the galaxy that slowly feeds the supermassive black hole. The other is idea is that you need galaxy mergers to trigger large growth. Our data argues for the second case, that these galaxy mergers are really critical in fueling the growth of supermassive black holes," said Koss. Like a siren before a tsunami, gravitational waves reach Earth slightly earlier than light. In order to image such an event, astronomers need to know where to look and what object to look for. Gravitational wave detectors tell astronomers what area, and Koss' research tells them whether that object is likely to host a supermassive black hole merger. The next step for Koss and his team is to follow up on these hidden black hole mergers with Keck Observatory's instrument, the OH-Suppressing Infra-Red Imaging Spectrograph (OSIRIS). OSIRIS will allow them to measure both the rotation rate and mass of the black holes, which would make it possible to estimate how long it will take before the supermassive black holes collide and how strong the gravitational wave signal might be. OSIRIS data will also look for signs to see if the two black holes are both growing simultaneously. W. M. Keck Observatory is a distinguished leader in the field of adaptive optics (AO), a breakthrough technology that removes the distortions caused by the turbulence in the Earth's atmosphere. Keck Observatory pioneered the astronomical use of both natural guide star (NGS) and laser guide star adaptive optics (LGS AO) on large telescopes and current systems now deliver images three to four times sharper than the Hubble Space Telescope. Keck AO has imaged the four massive planets orbiting the star HR8799, measured the mass of the giant black hole at the center of our Milky Way Galaxy, discovered new supernovae in distant galaxies, and identified the specific stars that were their progenitors. Support for this technology was generously provided by the Bob and Renee Parsons Foundation, Change Happens Foundation, Gordon and Betty Moore Foundation, Mt. Cuba Astronomical Foundation, NASA, NSF, and W. M. Keck Foundation.